Take a look at 2021. 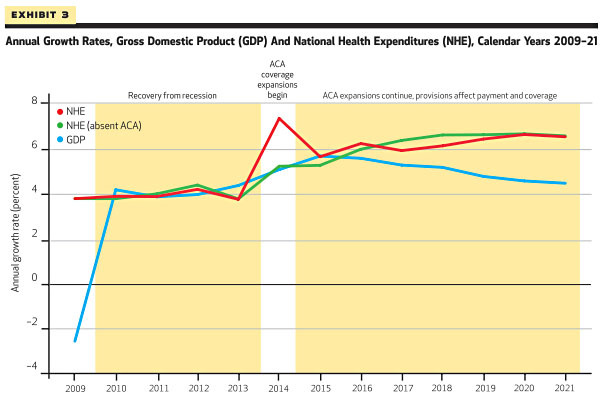 The red line is projected spending growth on healthcare. The green line is projected spending growth if we hadn’t passed healthcare reform. Do you see a difference? I don’t. Now, there are two conclusions you can draw from this. First, this report suggests that healthcare reform isn’t likely to rein in spending growth much. That’s the bad news. Second, it suggests that healthcare reform isn’t likely to cost very much. That’s the good news. Over at the LA Times, Noam Levey runs the numbers from the report and concludes that total national healthcare spending in 2021 without ACA comes to $4.72 trillion. With ACA it comes to $4.78 trillion. For that tiny amount — a difference of roughly 1% — about 30 million more people will have healthcare coverage. Pretty good deal, eh?